Cooper started swim lessons early this summer and he has been a total natural. Over a year ago we tried the baby-and-me type of swim classes where either Mike or I would be in the water holding him the whole time which he liked enough but he wasn’t interested in doing anything more than splashing. This summer, a switch must have flipped. He was all of a sudden obsessed with water: the pool, the hot tub, the bath tub. 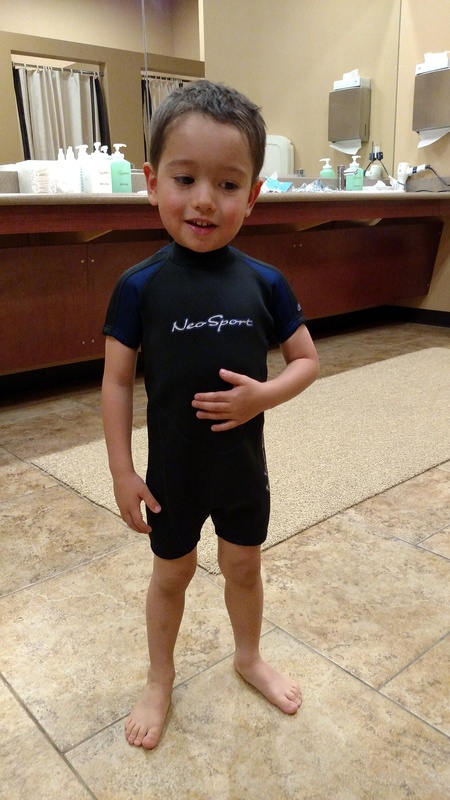 It was time to get him into real swim lessons! It’s funny how much confidence a pair of goggles can bring. Once he was introduced to them, we hardly ever saw him above water. On more than a few excursions to the pool, he would constantly duck under water just to check things out. He was holding his breath longer and longer underwater. He soon figured out how to propel himself, even if only for a couple of feet. As lessons progressed through the summer and fall, I was amazed at seeing this little person have so much fun in the water and being capable of so much already. He is far from being independent but we can already tell he is taking after his swimmer daddy. Good job Cooper! Just like your dad, right? GO and do a lot of practice swimming and ace your lesson. Another good accomplishment by your parents. Yay!! !